Workers in the fast food industry in New Zealand scored a spectacular victory over what has been dubbed “zero hour contracts” during a collective agreement bargaining round over the course of March and April this year. The campaign played out over the national media as well as on picket lines. The victory was seen by many observers as the product of a determined fight by a valiant group of workers and their union, Unite. It was a morale boost for all working people after what has seemed like a period of retreat for working-class struggle in recent years. Workers in the fast food industry have long identified “zero hour contracts” as the central problem they face. These are contracts that don’t guarantee any hours per week, meanwhile workers are expected to work any shifts rostered within the workers’ ‘availability’. Managers have power to use and abuse the rostering system to reward and punish, without any real means of holding them to account. This year, all the collective agreements with the major fast food companies (McDonald’s, Burger King, Restaurant Brands) expired on March 31. We were already in dispute with Wendy’s, as their agreement remains unresolved from last year. Unite Union was determined to end the system of zero hours and get guaranteed hours included in the new collective agreements. We had no illusions that this was going to be easy. We knew this would be a tough battle and we needed to prepare for that reality if we were to have a chance of success. At organizing meetings I would sometimes use a phrase that appealed: “If you want peace, prepare for war.” I was told later it is taken from a Latin adage: “Si vis pacem, para bellum.” Whoever coined the phrase, it is a wise strategy. These zero-hour contracts are not a new phenomenon. They became entrenched in the 1990s during the dark days of the Employment Contracts Act. They affect literally hundreds of thousands of workers in fast food, cinemas, hotels, home care, security, cleaning, hospitality, restaurants and retail. The fast food industry in New Zealand includes the foreign owned McDonald’s, Burger King and Domino’s Pizza chains, the locally-owned businesses that pay for the right to market brand names in New Zealand like Wendy’s and Restaurant Brands, and then the home-grown brands like Hell’s Pizza and Burger Fuel which also have international ambitions. We have been successful in negotiating collective employment agreements with McDonald’s, Restaurant Brands, Burger King and Wendy’s. None of these companies welcomed Unite Union’s presence. However, the competitive nature of the industry and the desire of these companies to protect their “brands” has given the union some leverage at times to amplify the organizing we have been able to do on the ground. It took a major, national SupersizeMyPay.Com campaign from 2005 to 2006 to get the first collective employment agreements. Our targets in that campaign were threefold: a major boost to the minimum wage; an end to youth rates; and what we called ‘Secure Hours’. Unite kept the pressure on the National government elected in 2008 by launching a petition drive in June 2009 to boost the minimum wage to $15 an hour. That gained over 200,000 signatures. Partly due to that, the new National government has felt obliged to maintain the minimum wage at around 50 per cent of the average wage. There have been increases every year they have been in government. We also got rid of youth rates, increased the paid break from 10 to 15 minutes, and won new wage rates above the minimum for workers after a certain period of time on the job, or in recognition of training. The frequency of paid and unpaid breaks was improved and enforced more effectively. We sought to improve the rostering regime and security of hours by introducing clauses into the collective agreements that said the companies should not hire staff before offering hours to existing staff. But these clauses proved ineffective and almost impossible to enforce given the companies complete control over rostering. We came to the conclusion that “secure hours” needed to be replaced by “guaranteed hours” as the only way to incorporate enforceable clauses in the collective agreements. Deciding to take on the major companies in a campaign to end a practice they have been happily using for several decades was not made lightly. We were convinced that so long as managers had the power to use and abuse a worker through their complete control over rostered hours, we would always have an uphill battle in getting workers to assert their rights and have the confidence to join a union. We get story after story of workers losing shifts for demanding the right to a break, for taking sick leave, for being ‘too lippy’. Often the managers in this industry are too young and inexperienced to be able to make judgements devoid of favouritism. Organizing fast food workers is a very difficult task. Workers are spread across hundreds of relatively small establishments often working 24/7 shifts. Turnover of staff is at least two out of three workers every year. Unite has 7000 members (including 4000 in fast food) and must recruit 5000 members a year just to remain at this size. The fast food sector is also heavily reliant on migrant workers on temporary visas which are often tied to a company. Typically, 30-40 per cent of staff are on these permits. These ‘visa workers’ are naturally nervous about doing anything that would displease their boss. McDonald’s has 9,500 staff spread over 163 stores, 80 per cent of stores are franchised. Franchise owners treat a worker joining the union as a personal betrayal. Average membership is only about eight per cent as a consequence. At the company-owned stores, we have about 30 per cent of staff as members. At Burger King, which has 80 stores and 2600 staff, our membership is about 25 per cent. This company is owned by the Blackstone Group – a U.S. vulture fund. We had to withstand a viscous anti-union campaign in 2012 that resulted in half our 600 members being forced to resign over a period of a few months. We are now back to our previous membership position, but the company and management remain actively hostile. At Restaurant Brands, which runs the KFC, Carl’s Jr, Pizza Hut and Starbucks brands, we have over 50 per cent of their 4000 staff as members. Here we have the benefit of the fact that the company is publicly listed and therefore a bit more responsive to public pressure and only a handful of stores are franchised. Having 4000 dues-paying members in the fast food industry is actually quite an accomplishment by international standards, especially where there is completely voluntary unionism in law as is the case in New Zealand. But further progress requires empowering workers so that the fear of the consequences of joining the union are removed as much as possible. So while our members were clearly telling us that this was a major issue, it was also clear that our long-term future as a union also depended on us cracking this issue. Again there was no secret to our views. In August 2014 we did a blog on a number of websites headed “Putting an end to Zero Hour Contracts in 2015.” We did a survey of fast food members and 1000 participated in the online survey. This was a fantastic result and reflected their deep concern. The results have been published here and are a fascinating read. What is very clear is that workers want more hours and more secure hours. We began talking to the media about the existence of zero hour contracts in the fast food industry and how bad they were for workers. The business editor for Radio New Zealand featured fast food workers and zero hour contracts in a series of reports over a week long period in November. 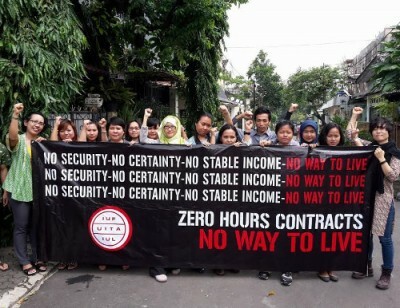 “Zero Hour Contracts” entered the public discussion like never before. Fortuitously at that time, the plight of many workers in vulnerable employment positions became ‘newsworthy’. Around the same time, a petrol station worker complained about having his pay docked because a customer drove off without paying. The worker was held responsible. His story became a sensation. Why this worker, at this time, suddenly became a ‘story’ worth telling I am not sure. But there was a broad, instantaneous public condemnation of the employer and his actions and sympathy and support for the worker. The media began looking for other ‘stories’ and our fast food workers had many stories to tell. On December 1-2, we held the Unite National Conference which formally launched the campaign. We had reps from other unions endorse and otherwise be part of our campaign. We had three opposition party leaders speak – Andrew Little for the Labour Party, Metiria Turei for the Greens and Winston Peters for NZ First. Again, media featured horror stories about zero hour contracts that were told at the conference, including one where a worker was stopped from leaving work despite coughing up blood and the worker complied because she feared having her hours cut the following week. More in-depth reporting began to appear. Labour and the Greens announced that they would have MPs sponsor bills for debate in parliament to outlaw zero hour contracts. We spent a month (mid January to mid February) engaging with members and doing surveys, discussing claims and getting worker volunteers for the campaign. We organized a national speaking tour with two young workers from the U.S. fast food workers campaign. The U.S. workers and Unite officials were able to brief a meeting of opposition MPs at parliament on the campaign as part of their visit. On February 24, Campbell Live – a major news and current affairs show broadcasting at 7pm on TV3 – joined the campaign against zero hour contracts with a story by Anna Burns-Francis called “Zero-hour contracts leave Kiwi families struggling.” This programme gave a human face to the issue by interviewing two McDonald’s workers, both of whom were part of the union bargaining team. It showed the contract clauses in the fast food company employment agreements offering no guaranteed hours. It also had images of workers fighting to change this state of affairs in previous years through strikes and pickets. Shortly after the launch of this campaign by Campbell Live , the managing director of Media Works which owns TV3, Mark Weldon, announced a “review” of the future of the show. The company had been taken over by the big banks in 2013 in a debt restructure following a failed private equity takeover. Mark Weldon has made it clear he is not interested in news as such – particularly not in the type of investigative, advocacy journalism represented by the campaign against zero hours on Campbell Live . The fast food giants are also large advertizers on TV3 and would no doubt have expressed their displeasure. The same week these major media reports ran, we also began bargaining with McDonald’s, Burger King and Restaurant Brands. Morale in the bargaining teams was high. We were going into bargaining with the backing of not just our members but with significant media support and the overwhelming support of people throughout New Zealand. This was demonstrated in a later, very popular Campbell Live show which had John Campbell interviewing McDonald’s drive through customers. They were unanimous in condemning zero hour contracts including by some of those interviewed who identified as employers. For a number of reasons, we expected movement from Restaurant Brands first. We were stronger there and the company had begun their own process of centralizing the roster process which had led us to think they may be looking more seriously at meeting our expectations in bargaining. However, the company dragged its feet and made no meaningful offer on guaranteed hours until the contract had expired and we had told them we were going to a strike ballot. Maybe they were just testing our resolve. When they did come back with an offer early April it was a meaningful one. They promised to guarantee 80 per cent of hours worked over the previous three months. This would be a rolling average that would allow the guarantee to improve over time – especially for those who volunteer for extra shifts. Moreover, the union and the company have also agreed to trial permanent shift patterns at some stores to see how that may improve things. Most workers want regular shift patterns as well as secure hours and both the company and the union expect that to be the final outcome of a guaranteed hours regime. Campbell Live reported the victory, but so did many other media outlets as the issue had become mainstream. TVNZ, the other main television news channel in New Zealand, rarely reports any news about Unite activities but did this time. Wendy’s workers took action in February and March while the other companies were bargaining. Strikes occurred in Auckland, Palmerston North,Christchurch and Dunedin. The opening of a Wendy’s store in Dunedin helped focus the campaign there for a protest on March 14. Again, the local media approached the issue with care and depth. Then McDonald’s made sure the non-union staff got their pay rise before union members by delaying bargaining for two weeks with the claim they would be bringing a meaningful offer on guaranteed hours that would be a “game changer” in the industry. When they came back to the table in early April, their offer was a joke, affecting at best ten per cent of their staff. The ‘offer’ in fact underscored the importance of getting rid of zero hour contracts because they wanted the “right” to take secure hours away again even for this group of workers if they did two ‘no-shows’, that is the situation when staff don’t turn up for a rostered shift and have failed to notify the company beforehand or have given what the company considers an inadequate reason for the absence. By including that escape clause, the company was confirming that they viewed the roster as a tool to discipline and punish workers without a proper lawful process. At this point, we told the company we were “in dispute” and would be taking a ballot for strike action. However, bargaining continued with McDonald’s after the strike ballot was held and before the day of action on the 15th. At one session, McDonald’s made a deliberately deceptive offer to the union that claimed to get rid of zero hours and released that offer to the public while we were still in bargaining. They said they would guarantee 80 per cent of ‘rostered’ hours. That formula is simply nonsense. Any company can guarantee 100 per cent of rostered hours because they control the roster. Rosters go up and down. They are at the discretion of the company. The union can’t see them or enforce anything to do with them. On average workers work 20 per cent more than their rostered hours because over employing and under rostering is the essence of the zero hours regime. It keeps workers willing to jump at offers of more hours. That is why we decided to use the formula of 80 per cent of hours worked with Restaurant Brands. We can monitor and enforce that formula. McDonald’s was hoping to appear reasonable and paint the union as acting in bad faith. But their strategy backfired and the media saw their ‘offer’ for what it was. The company was publicly claiming there was no real difference between rostered hours and hours worked. They asked for a further round of bargaining with a mediator from the Ministry of Business Industry and Enterprise assisting before the April 15 action. This was held on April 14. However, the company representatives refused to budge from their formula of rostered hours and the union bargaining team walked out to prepare for the strike action the next day. This time, the company came to bargaining with a clear proposal to end zero hour contracts and a timetable for implementation. It was based on the formula of guaranteeing 80 per cent of hours worked, and this calculation to be repeated every three months. New staff would be given an initial guarantee which would be reviewed after working through a three month block. But when we asked for clarification of what this meant for secure and regular shifts going forward, and expressed a desire to continue bargaining on some other matters, the company walked out in a huff. The largest daily newspaper in the country, the NZ Herald , carried an editorial on April 16, that never mentioned Unite or unions once but did focus on the real issues in dispute. Mike Treen is a Unite National Director. This article first appeared on the Unite website.